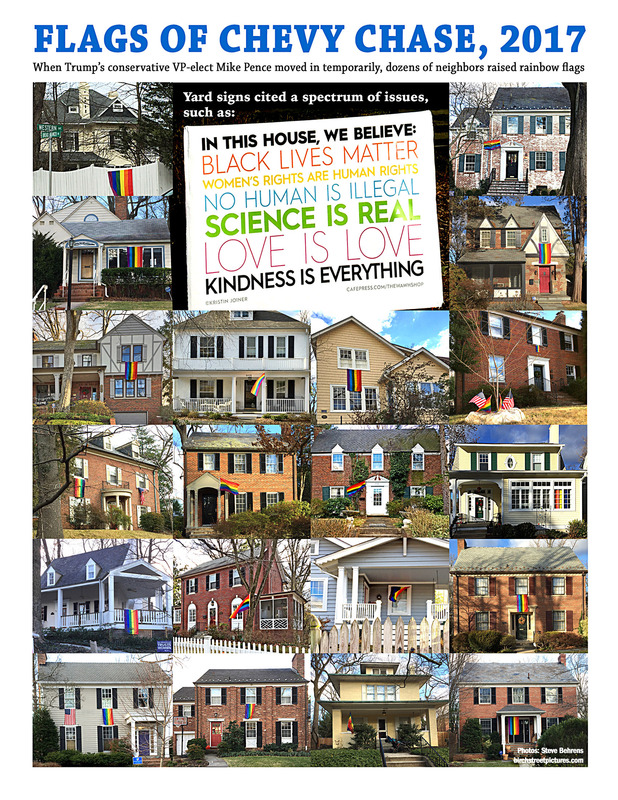 After word got out that newly elected Vice President Mike Pence had rented a pre-inaugural pad in D.C.’s quiet, upper-crusty Chevy Chase area, neighbors began hanging rainbow flags. 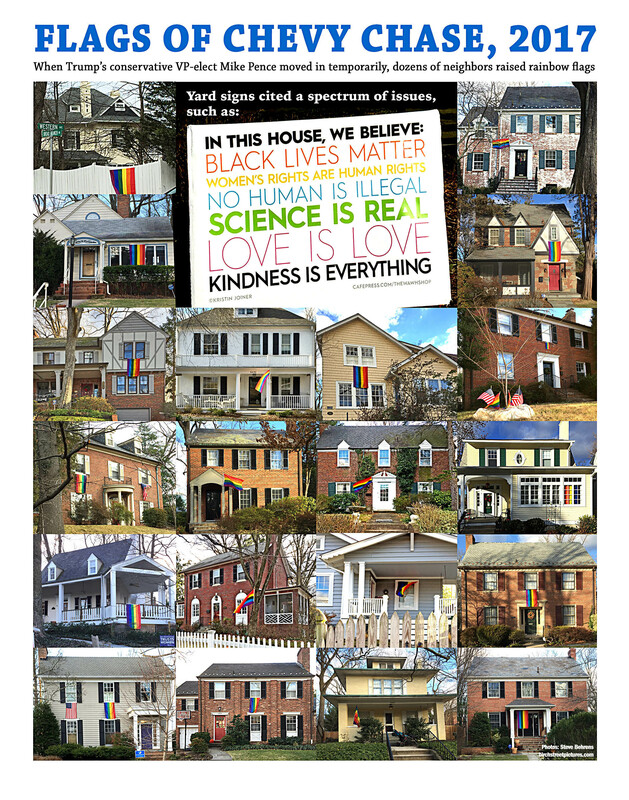 First, people in several of Tennyson Street’s staid rectangular houses let their freak flags fly, owning a symbol for sexual minorities still evoke hatred or shame among Pence’s voters back in Indiana. Then dozens of flags appeared nearby, and now many more hang around Northwest D.C. Many of the flags still show their creases from recent delivery in UPS packages. To commemorate these unexpected political acts, here’s a poster you can print. Pence earned his demerits as governor of Indiana, endorsing the state’s loosely worded “religious freedom” law, which allows businesses and individuals to discriminate on the basis of sexual orientation or exercise their choice of other faith-based bigotry. Though the rainbow has been adopted most widely as a symbol for sexual-orientation minorities, it recalls the broader role it had in the once-hoped-for bigger-tent progressivism of Jesse Jackson’s Rainbow Coalition. Pence’s neighbors also posted yard signs asserting that Black Lives Matter, that women should be trusted to make their own birth decisions, and that Congress should continue assisting Planned Parenthood. On Jan. 18, pro-LGBTQ protesters added a noisier Pence protest, venturing more than a mile out dark and creepily quiet Western Avenue from the nearest subway station to hold a nighttime “queer dance party” at Tennyson Street. Pence and family had plans to leave anyway. Within three days they had fled to the better-fortified political bubble of the vice presidential mansion on Embassy Row.